Ahead of the Academy Awards, we’re reviewing each short category. See the Documentary section below and the other shorts sections here. You hear horror stories of people who foster children in order to pocket the money they receive from the state meant for that child’s wellbeing and want to hope they’re the exceptions rather than rule. It’s easy to be cynical, however, and believe the opposite in this world. The same can be said about elder care and the often-tenuous relationships between children of aging parents with increasing struggles. Infighting is common because not every child is as well off as the next or as close. Suddenly a consensus can’t be reached and a third party guardian is appointed as power of attorney. Now that elderly parent who doesn’t know or understand what’s happening must relinquish their control to an objective outsider without an emotional connection to the case. 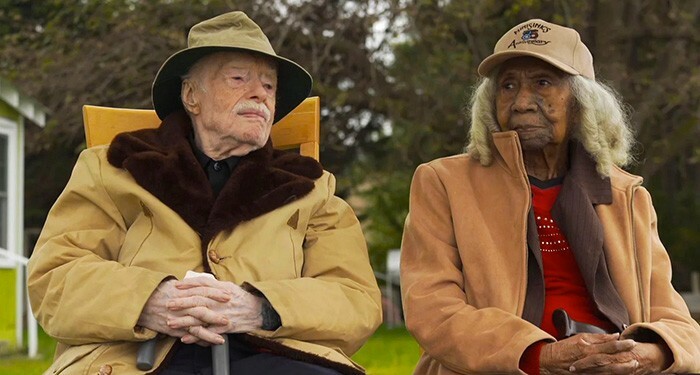 This is the scenario facing newlyweds at age 96 and 95 respectively, Edith and Eddie. After spending ten years together with a story about splitting a winning lottery ticket serving as their meet-cute love at first sight origin, the law is trying to tear them apart. Behind the courts, however, are also two women: Edith’s daughters Patricia and Rebecca. The former lives in Florida and has apparently been awaiting the eventual payday that selling her childhood home would yield if she can place her mother into a retirement community. The latter resides in Virginia and helps care for her mother and Eddie as they take up residence in that childhood home as (mostly) autonomous adults. Rebecca sees their love first-hand and knows it’s more important than anything else. Director Laura Checkoway’s documentary Edith+Eddie takes us into what’s ostensibly a sad feud between sisters wherein the state has rules to intercede. An intermediary is assigned the case and paid by Edith’s estate to keep her “best interests” in mind despite never meeting her or Eddie to judge the situation beyond a clinical diagnosis of dementia. This film therefore does what Jessica Niesen doesn’t: paint a picture of reality beyond words on a page. It provides subjective yet solid proof that Edith is happy. It shows that this marriage isn’t some attempt to steal Patricia’s inheritance and that Rebecca is very much involved in both of their lives as caretaker. We witness the potential of a court-sanctioned kidnapping hinged upon Niesen’s out-of-context facts that ignore Edith’s inherent humanity. It’s not easy to depict mental illness with honest clarity or art’s cathartic influence as therapy, but Frank Stiefel’s look at Mindy Alper entitled Heaven is a Traffic Jam on the 405 does both. It helps that Mindy is an open, self-aware subject despite crippling anxieties. She leads his camera through her struggles as represented by surreal drawings created throughout her fifty-six years — a roadmap traversing her life’s extreme highs and lows. The work is reminiscent of Ralph Steadman and Gerald Scarfe, each imperfect line lending the pictures emotion and character without compromising authenticity. They tell a story of psychological and physical abuse, role models who looked past her ailments at the imagination and creativity within, and a woman unafraid to acknowledge the pain she’ll never fully conquer. Stiefel treats Alper with sensitivity, allowing her to talk about her past and present without prompts or coaching. He sets up the camera and lets her speak, splicing in frames of her drawings (static or subtly animated) that embody the truth of her experience better than words ever could. Mindy explains her long-prevalent phobias concerning skin and “cooties,” the nervous breakdown that took her voice for ten years, and the elective shock therapy that damaged her brain while also very possibly saving her life. She does it with a deliberate cadence as she acquires the right words to say, her phrases broken down to their parts for contextual relevance if not semantic perfection. One memory leads to another until the reality of her childhood reveals its scarring complexities. The candor at work is the film’s strongest attribute because Mindy refuses to sacrifice her wellbeing to shine someone else in a rosier light. She can go from saying she speaks to her mother three times a day to matter-of-factly positing that the woman didn’t have the maternal instincts to protect her when they were needed the most. Damning evidence arises which may imply Mindy’s father was more abusive than she willfully admits, but she firmly holds to her belief that he wouldn’t have crossed this specific line despite crossing so many others. Her expressive recollections lend her words a transparency that can only be learned after decades of therapy and acceptance. All the chaos she bottled inside during her tumultuous youth now flowing freely into her art. 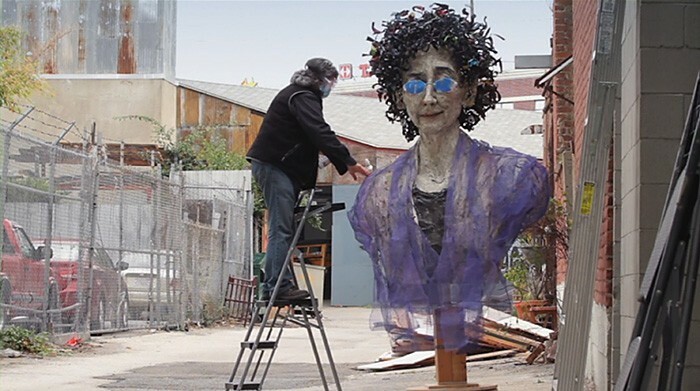 Whether line drawing, painting, or papier-mâché, Mindy exposes her soul. With the help of teachers and doctors she holds as dear to her heart as family, her depression and psychosis has been suppressed to the point of functioning in arenas that had scared her to the point of silence. Where many might have used her success as a means to declare mental illness solvable, however, Stiefel lets Alper stand as an example of its process. Her story normalizes what so many — her father included — refuse to believe as anything other than avoidable weakness. We see her backslide into dark thoughts, struggle through anxiety, and come out with a smile that reveals the hope of better days. We often take for granted how profound it is to simply be heard. We too often see a problem in its worst form via “scared straight” videos that depict it in all its graphic detail for those living within its clutches. Drug use is the main culprit for this type of vehicle because the prevailing notion is to think knowing something can kill you is enough to provide you a reason to stop. But as we see with cigarettes, addiction moves our psyches beyond logic. It moves people’s minds to dark places wherein death may even appear to be a worthwhile escape from the seemingly never-ending cycle of poverty, prison, and relapse. So it means something to push that aside. While tragedy does unfortunately earn higher ratings and pays the bills, a feel good story done right can literally save lives. Elaine McMillion Sheldon’s Heroin(e) is a perfect example. It proves how a film can portray Huntington, West Virginia’s crazy heroin overdose statistic being ten times higher than the national average while also providing an optimistic outlook for the future. Rather than go door to door to watch as addicts given Narcan either wake up or die, Sheldon finds the humanity numbers too easily ignore. She puts a camera on Brown Bag Ministry founder Necia Freeman, Judge Patricia Keiller, and Fire Chief Jan Rader to reveal the silver lining of an epidemic that could risk bankrupting our nation. Suddenly the stereotypical “Jesus freak” giving food to prostitutes, hardline judge putting low-level users in jail, and first-responder providing a so-called “lifeline” are shone as the heroes they’ve always been. We watch as unfortunate souls fail themselves and understand that these three women do what they must to earn the respect they desire as far as honoring the lengths they’re willing to go to help. It means something because we also see those who have climbed out of the grave to serve as examples for those who don’t believe it’s possible. The “war on drugs” isn’t about enacting laws that make it impossible to overcome what it is that got them there. It’s about finding solutions and creating paths to recovery even if it means accepting the majority of those caught in heroin’s wake will need five, ten, fifteen chances. Education and compassion supply hope to the hopeless. Save one life and he/she may end up saving ten. One of the students at Edwins Leadership & Restaurant Institute explains how ex-convicts wear the stigma of that label as a badge. It tells potential employers that they are willing to work harder and prove their loyalty because anyone who gives them a chance at a second life is someone they’d do anything to repay. There’s a lot of truth to this sentiment even if it isn’t a guarantee. Those who do leave prison with a desire to better him/herself and contribute to society will possess those traits. Unfortunately not everyone has that specific passion or good fortune to prove it when addiction, allegiances, and external circumstances interfere. Provide the opportunity to change that luck by offering someone a redemptive road, however, and you will literally save lives. 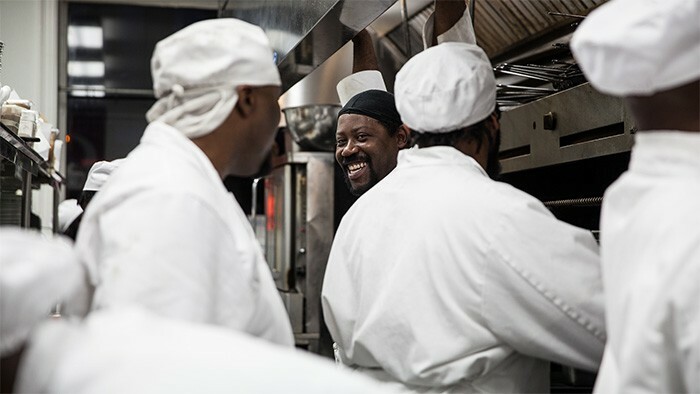 It’s therefore not surprising that the man at the center of Thomas Lennon’s short Knife Skills — a man who goes out of his way to hinge his livelihood and business on the backs of ex-cons — was almost one himself. Brandon Chrostowski was facing five to ten years of hard time when the judge granted him leniency and a one-year sentence of probation instead. In a real-life example of “paying it forward,” he would educate himself in the culinary arts and reach a place in his life where he could open a restaurant in Cleveland, Ohio with the purpose of granting his own form of “leniency” to others. With French chef Gilbert Brenot at his side, Chrostowski hatched Edwins as a school to teach a trade and offer hope. Lennon takes us inside to watch this social project from its six-week training program attended by men and women with little to no formal culinary education to the restaurant’s grand opening where each student works inside the kitchen and out to the celebration enjoyed by all those who stuck with it and completed their full six-month class. He focuses on a handful of standouts either because of their ability to excel or their missteps so we can understand the why and how behind what could be seen as a controversial experiment. Chrostowski tells us the hard facts about how 180 applicants gets whittled down to the class cap and then further as a result of skills, temperament, and extenuating circumstances. The adventure isn’t perfect, but it is inspired. The tough thing to acknowledge is how a single second chance is rarely enough. Brandon knows this better than anyone as his emotional testimonials reveal the self-loathing that remains beneath his suited exterior and the frustration of knowing he still has to work at suppressing his own temper when triggered into action. Some of his students do everything in their power to succeed and others find themselves helpless to a life of trouble they simply can’t yet leave behind. And while Lennon doesn’t show the ones who let ego burn bridges down, he does expose the difficulty of some to reconcile who they are and who they hope to be within the constraints of a world that demands and admires as much humility as it does strength. Some topics deserve the time to delve underneath the surface of what we see, know, and assume. The violent arrest of Breaion King is one such incident where thirty minutes is simply not enough. 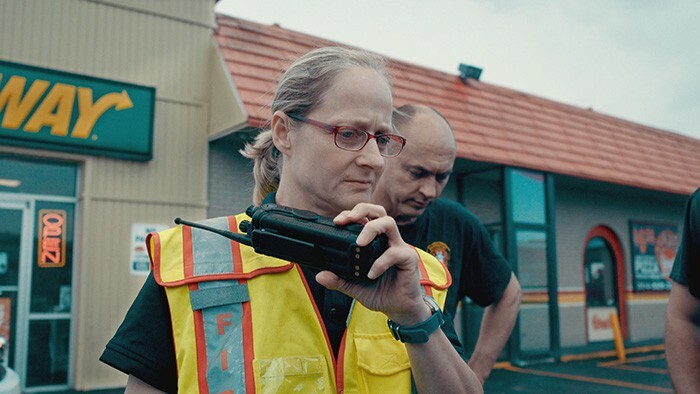 But that’s what director Kate Davis has to deliver the intricacies of what occurred in the moment and historically to bring Breaion and officer Brian Richter to it. Traffic Stop does a wonderful job asking the tough questions, but it never really answers any of them. It chooses a side — the correct one — and focuses on a lot of superficial backstory unable to truly breakthrough towards the real issues at hand. It shows King to be everything racist white people don’t believe black people can be as though that’s enough to prove its point. Unfortunately it’s not. Rather than shine a light on the police brutality targeting black communities throughout the United States regardless of whether the person assaulted has a criminal record or a Ph.D., it argues that Breaion didn’t deserve to be a victim because she falls in the latter category. 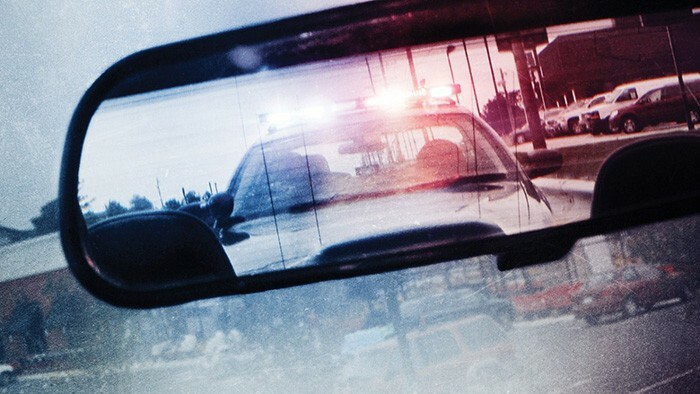 The film never tries to breakdown the dash-cam video and see where things went wrong in order to educate drivers and officers about what should have happened differently. It merely presents it in full under the guise of being cut and dry — something it’s not. While it does prove beyond a shadow of a doubt that Richter needed to be stripped of his badge (he was finally fired three years later), it ignores nuance. The issue is trust. Breaion had no trust in the officer who arrested her. Why? This is the question we need to ask. You can’t say she should have put her feet in the car so he could close the door and not touch her — things aren’t that easy. We’ve all watched black men and women die by a cop’s gun after following orders and staying still. The fear is real. What happens if she closes that door? The dash-cam loses visibility and Richter can do whatever he wants and explain it however makes him look like a hero. This is how the system is broken. The black community has to mistrust the police as a survival technique. They assume the worst because the worst happens too often. But Davis glosses over this truth. She takes us into King’s classroom instead to show the eight students who rely on her for safety and education. She spends the majority of this short humanizing the person we have no trouble humanizing. King is the victim. To question that is to admit you are most likely racist yourself. What then is the purpose of the film? Why is it trying so hard to paint its victim as a victim when the dash-cam footage shows it with pure objectivity? I honestly don’t know. It wants to show the disconnect between racist cops and innocent black victims, but focuses instead on socio-economics and education as though her status with both means she never should have been in this situation. That’s backwards. The goal should be showing how neither matters. Richter doesn’t care about Breaion’s occupation or address. He sees a black woman and lets his racist tendencies turn an exchange that needed compassion into one with extreme violence. I don’t therefore see how the film adds anything to the conversation. Its goal is less about bringing attention to the issues below the surface and more a straight biography trying to clear its victim’s now-sullied name. But that route reveals issues with the media’s portrayal of violence and the ubiquity of misinformation through incomplete news. The reason King sees mug shots when Googling her name is because that system is broken too. Without saying why or how to fix anything, though, Traffic Stop wastes its potential to be more important. The Oscar Nominated Shorts are in limited theatrical release starting February 9th. See the official site for more details and our reviews of the other shorts sections here.